A certain kind of drama almost always plays out when EFCC arraigns an accused person in court. The defence counsel would immediately apply for court bail. However, if the court temporarily denies the application, the counsel would again rise in open court and passionately plead with the trial judge to allow his client remain in EFCC holding facility, pending the determination of bail, or, where his application was granted, pending fulfilment of bail conditions. The media men saw things firsthand and freely interacted and conducted interview with suspects of their own choosing. 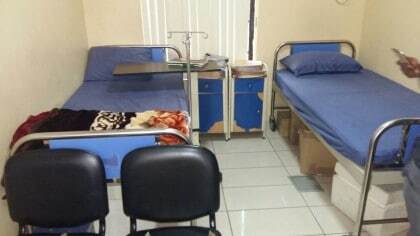 They also toured the clinic attached to the cells, fully manned and run 24 hours round-the-clock by two qualified medical doctors, nurses and other health professionals. Among the other medical and diagnostic facilities, is a dedicated ambulance. The journalists also saw the meals served the suspects, which are sourced from the EFCC Staff Canteen. Those who prefer relatives to bring their meals from home, are so obliged. At the end of the tour, one reporter described the detention facilities as ‘A guest house for the big boys’. Acting Chairman, Ibrahim Magu, however threw a challenge to the reporters: “If anyone of you think all these have been arranged, you are welcome to come at anytime you chose, to spend time with us and see for yourself (you can even spend some days in the cell); see how EFCC carries out investigation, arrest, interrogation and if you want, be detained as long as you say, in any of our facilities across the country. You don’t need to give us prior notice of your coming. You can even arrange it as a group of reporters if you don’t want to come alone.” He must be truly confident in EFCC’s detention facilities.